Galerie de l'Elysée (Alex Maguy), Paris. A. Vollard, Album Degas, Paris, 1914 (illustrated pl. 38). P.A. Lemoisne, Degas et son oeuvre, vol. III, Paris, 1947, no. 1411, p. 812 (illustrated p. 813). Depictions of dancers occupied Degas for the vast majority of his artistic life and the subject matter accounts for by far the most prolific group of works in his oeuvre. For him the dancer represented a perfect model, endlessly repeating the same movements and providing him with seemingly limitless poses through which he could explore the human figure and the torsions created from her movement. Impressionism, New York, 1973, p. 566). 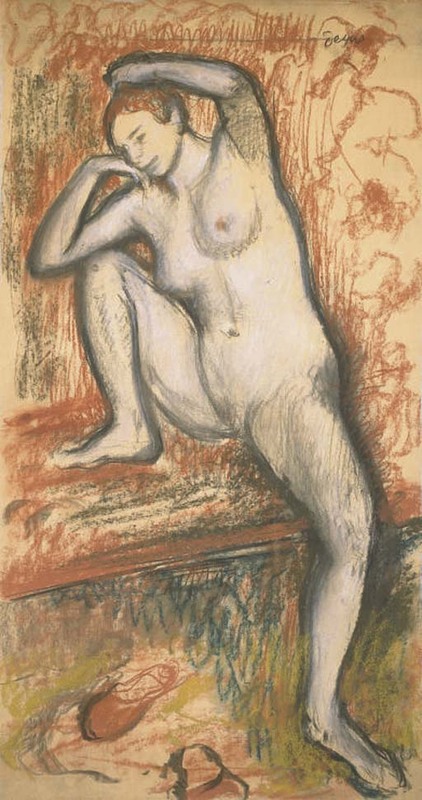 Etude de nu pour une danseuse, executed circa 1902, is a wonderfully vibrant example of Degas' mature pastel technique. Straddling the often blurred boundary between the dancer and the bather in Degas' oeuvre, the present work belongs to a series of works, all grouped together in Lemoisne (nos. 1409-1415), which explore this complex pose; the model's raised arm rests on her head, which in turn rests on her other arm and her raised knee. The result conveys both movement and stasis, both torsion and harmony. The grouping of these works compares this dancer's pose with that of the bather who raises one arm to wash the back of her neck, while her other arm hangs down creating a serpentine line across her back. Etude de nu pour une danseuse is unusual in Degas' oeuvre in his use of a very strongly delineated, heavy charcoal line, running around the entire body. Creating a stark silhouette against an intense, brightly coloured and vibrant background, this cloisonnisme perhaps betrays the influence of Gauguin or even that of Van Gogh on Degas' late work. 'The dancer could be seen as an incarnation of drawing. Line was the governing element of her achievement, the right and the wrong of what she was doing. Line was given by her limbs, her arms and legs, the centering of her body, her à plomb. To draw a dancer's body was to re-enact through her limbs the terms of figure drawing itself, both as description and as expression. How often in his drawings of dancers the line of an arm or a leg will soar out from the body, cutting out a shape that has no meaning that can be translated but presents itself simply as a measured claim upon space?' (R. Gordon & A. Forge, Degas, New York, 1988, p. 176). Etude de nu pour une danseuse has a very distinguished provenance, having belonged to the foremost Parisian art dealer of the early twentieth century, Ambroise Vollard and also to Alex Maguy, who opened his celebrated Galerie de l'Elysée on the rue du Faubourg Saint-Honoré in 1955, before entering the present owner's collection.